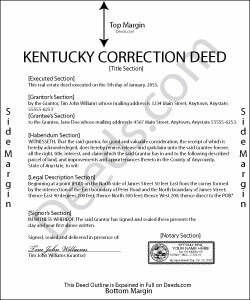 In Kentucky, use a correction deed to amend a previously recorded deed that contains a minor error. A corrective deed is in effect an explanation and correction of an error in a prior instrument. As such, it passes no title, but only reiterates and confirms the prior conveyance. It must be executed from the original grantor(s) to the original grantee(s), and it needs to be recorded in order to be legally valid. Deeds of correction are most appropriate for minor errors and omissions in the original deed, such as misspelled names, omission of marital status, or typos in the legal description. When making more substantial changes, for example to the vesting information or legal description of the property, it is best to seek legal advice regarding the long-term consequences. Kentucky statutes give the following examples of corrections that can be made with a deed of correction: the number of acres or the source of the title for example (KRS 382.337). This implies that some material changes, such as the amount of property and errors to the chain of title, can be addressed through a correction deed. However, adding a name to the title or removing a name from it cannot be achieved via a correction deed in Kentucky and instead require a new deed of conveyance. Another correction vehicle available in Kentucky is the affidavit of correction. It can be filed by one of the parties or the attorney who prepared the deed, but the statute limits its use to errors in the marital status and the acknowledgment or notary section of the deed (KRS 382.337), so they are only useful for a small number of corrections overall. Correction deeds cost less to record in Kentucky than standard deeds, and they are exempt from transfer tax, and a consideration certificate is generally not required (KRS 382.135) unless the consideration amount is different from that in the prior deed (KRS 142.050). In that case, a new consideration certificate, notarized and signed by grantor and grantee, is required, and the clerk might collect additional transfer tax if the consideration amount is higher than in the prior deed.